Posted on Thu, Feb 16, 2012 : 1:24 p.m.
Editor's note: This article has been updated to clarify that Dennis Moore has endorsed Pete Hoekstra. The Willow Run Tea Party Caucus has suspended endorsement of candidates. 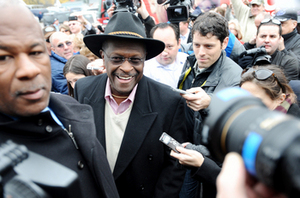 Herman Cain during his campaign appearance at the Big Sky Diner in Ypsilanti in November. The two will appear at an event beginning at 4 p.m. The campaign stop is open to the public on a first-come, first served basis, said Dennis Moore, founder of the Willow Run Tea Party Caucus, which meets weekly at the diner. Moore has endorsed Hoekstra. Cain campaigned at the diner in November, before dropping out of the race amid accusations of sexual harassment and infidelity. Moore urged those who hope to get a seat inside the diner to come early. Hoekstra, who co-founded the Tea Party Caucus while a member of the U.S. House of Representatives, and Cain will discuss budget issues in Washington as well as a conservative plan for reform, Hoekstra’s campaign said in a news release. "During his time representing Michigan, Pete stood by his conservative principles, he fought for a balanced budget, and he worked to cut spending. That's the kind of leadership we need in Washington." Hoekstra and Cain will start the day in Grand Rapids and make stops in Kalamazoo and Ypsilanti before ending the day in Troy. Hoekstra is campaigning to defeat Democratic U.S. Sen. Debbie Stabenow. Contact Cindy Heflin at cindyheflin@annarbor.com or call her at 734-0623-2572 or follow @CindyHeflin on Twitter. Fri, Feb 17, 2012 : 12:33 p.m. I loved eating the food at Big Sky. However now that I know the owners strong political leanings I will no longer give them any money. Keep politics out of my food and you get to keep the money from my wallet. Fri, Feb 17, 2012 : 4:59 a.m.
My heart goes out to the female waitstaff at the Big Sky Diner. Thu, Feb 16, 2012 : 11:27 p.m.
Well, since Pete Hoekstra is now Mr. &quot;Spend-It-Not&quot;, we can assume that Herman Cain will be picking up their tab. Thu, Feb 16, 2012 : 9:46 p.m.
Couldn't Hoekstra get someone other than Cain? Where is Sarah Palin when Pete needs her the most? Thu, Feb 16, 2012 : 9:01 p.m. The last I checked the Big Sky allows the Willow Run Tea Party to meet there once a week. Now they are allowing Hoekstra to campaign there. Further evidence why Big Sky Diner remains on my personal boycott list. I unfortuantely live near Big Sky and would be stopping in spending my money there but they are a little too blatant in their political support. Not good for business in my books. Thu, Feb 16, 2012 : 8:58 p.m. Excellent. I'll be at the Sidetrack. Thu, Feb 16, 2012 : 8:15 p.m. I love these guys and I can't wait to vote for Hoekstra. Time to elect someone who can start to fix the damage Debbie has caused. Thu, Feb 16, 2012 : 8:19 p.m.
Thu, Feb 16, 2012 : 7:53 p.m. They should meet at Lucky 7. I recommend the szechuan pickled cabbage &amp; pork soup with a side order of humble pie. Thu, Feb 16, 2012 : 7:37 p.m. It appears that all Hoekstra's opponents need to do to win over voters is to repeat his talking points verbatim and say where they came from. Thu, Feb 16, 2012 : 7:36 p.m.
Well, we saw what Hermie's support did for Gingrich didn't we ? ROFL. Kiss of death. Thu, Feb 16, 2012 : 7:17 p.m. Well...I can already tell you what they will be serving. Thu, Feb 16, 2012 : 10:19 p.m.
Thu, Feb 16, 2012 : 8:11 p.m.
Thu, Feb 16, 2012 : 7:29 p.m.
Thu, Feb 16, 2012 : 7:04 p.m.
Jokestra and Can't. Good combo. Maybe they should make a sandwich and call it the Republiconned. Thu, Feb 16, 2012 : 6:41 p.m.
i couldn't recommend a finer dining establishment.